Scientific literature reveals that symbolic representation techniques behind some formal methods are attractive to synthesize parts or verify properties of large discrete event systems. They involve, however, complex encoding schemata and fine tuning heuristic parameters in order to translate specific problems into efficient BDD or SAT-based representations. This approach may be too costly when the main goal is to explore a theory, understand by simulation its underlying concepts and computation procedures, and conduct experiments by applying them to small problems. 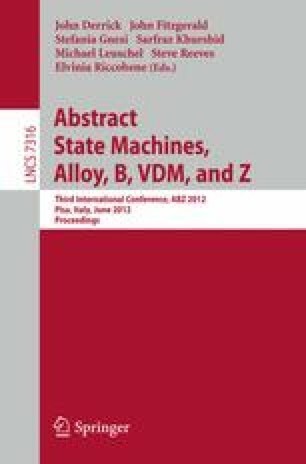 Based on previous work with Alloy on the synthesis of observers and nonblocking supervisors of a system organized hierarchically with a flat state space estimated to 1031 states, this paper investigates more deeply issues raised with its use in the modeling and prototyping of the supervisory control theory, including the application of models to practical problems. This study was conducted in a broader context than just hierarchical control since it embraces various variants of this theory. The research described in this paper was supported in part by the Natural Sciences and Engineering Research Council of Canada (NSERC).